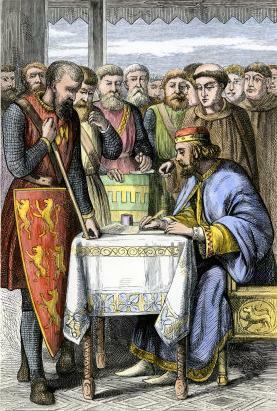 King John signing the Magna Carta in 1215. According to the Declaration of Independence, what is the main purpose of government? To control dangerous people through harsh punishment. To ensure that everyone has enough food, shelter, opportunities, and other resources for the pursuit of happiness. To protect the natural rights of citizens. To improve the moral, intellectual, and social character of man. An extensive library of resources. Teachers can access all student readings along with corresponding teacher materials including classroom activities, presentations, and assessments. Teachers understand what's needed to properly teach content in the classroom better than anyone else. That's why all of our course content is written by teachers. Resources created by fellow teachers. All materials meet a variety of standards including state standards, Common Core standards, and College Board standards. All of the content covered in traditional textbooks. The course content covers all of the critical areas of civics, economics, and American history that are included in American Government by Magruder; Civics Today: Citizenship, Economics, and You by Glencoe; Economics: Principles in Action by Prentice Hall; and Civics in Practice: Principles of Government and Economics by Prentice Hall.